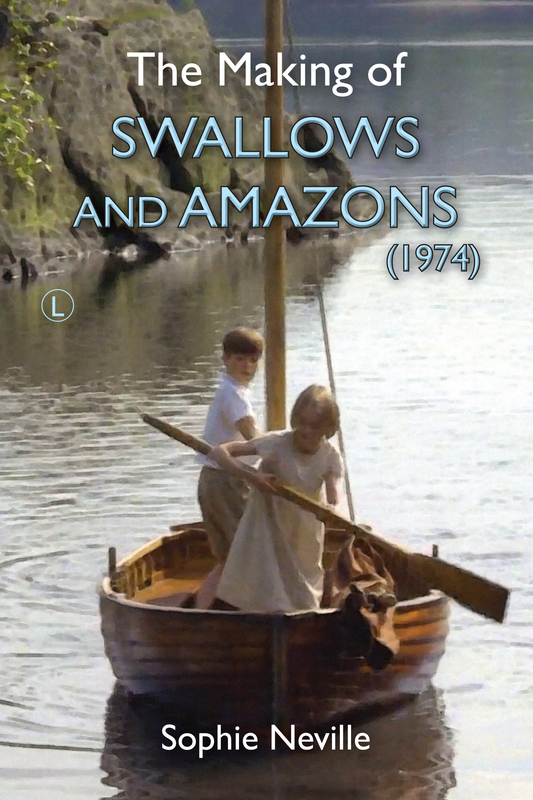 Revelation Films have just contacted me, saying that they are thinking of producing new packaging for a 30th Anniversary release of ‘Swallows and Amazons Forever!’ This is the BBC Drama adaptation of ‘Coot Club’ and ‘The Big Six’ that starred Rosemary Leach, Julian Fellowes, Colin Baker, John Woodvine and Henry Dimbelby not to mention William the pug dog, who became a national treasure when he took on the role of Ethel’s Little Willie in Eastenders. I worked on the television series that was shot on 16mm film entirely on location in East Anglia. 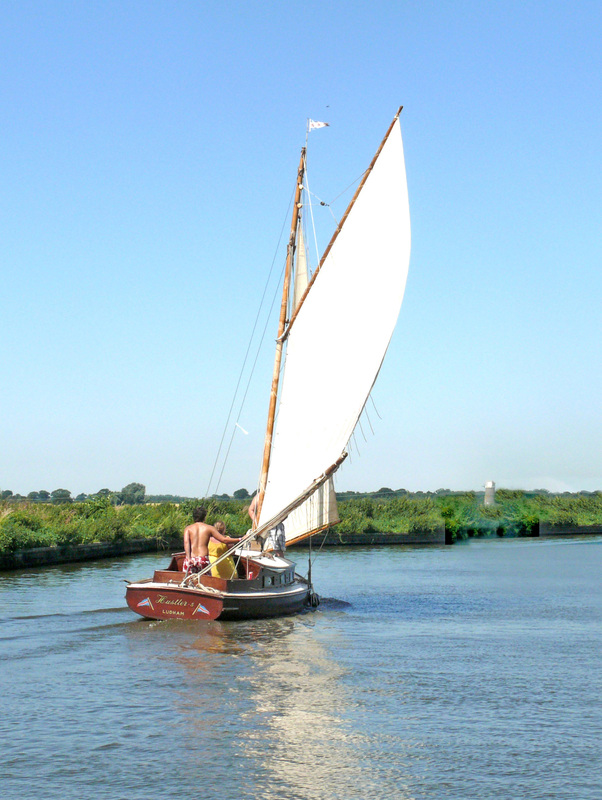 We spent an idyllic summer, mainly afloat on the Norfolk Broads. They tell me that this DVD is one of their top ten bestsellers along with LA Law, Highway to Heaven and Dr Quinn, Medicine Woman starring Jane Seymour. What wording would you use on the new cover? 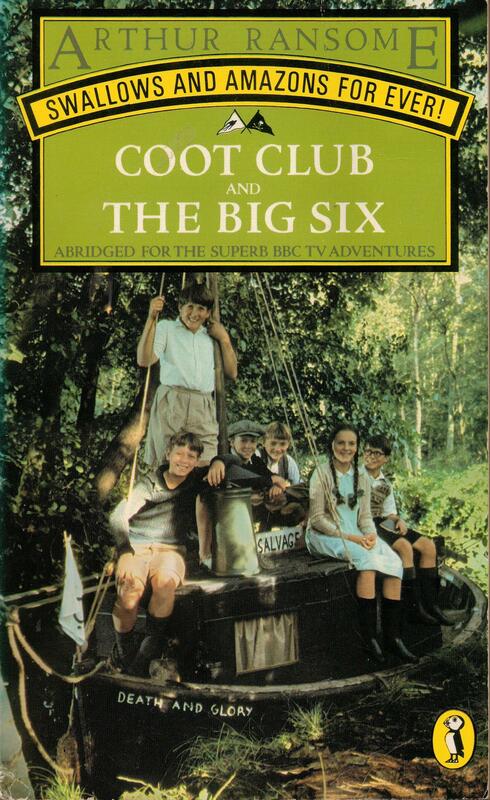 I want to suggest they have the book titles in larger letters: ‘Coot Club’ and ‘The Big Six’ by Arthur Ransome. Neither the Swallows or the Amazons appear in it after all. However, interesting actors such as Patrick Troughton and Sam Kelly do. I thought that including photos of them might appeal to those who appreciate Classic TV. It was thought that my shot of Julian Fellowes playing Jerry the Hullabaloo showed him looking too young to be recognised these days. I am sure he’d agree with me that it is just the mustache that is somewhat distracting. I don’t remember it being a real one. The production manager at Revelation Films told me she liked the photograph used on the cover of the Puffin Book, which I explained depicted The Big Six. 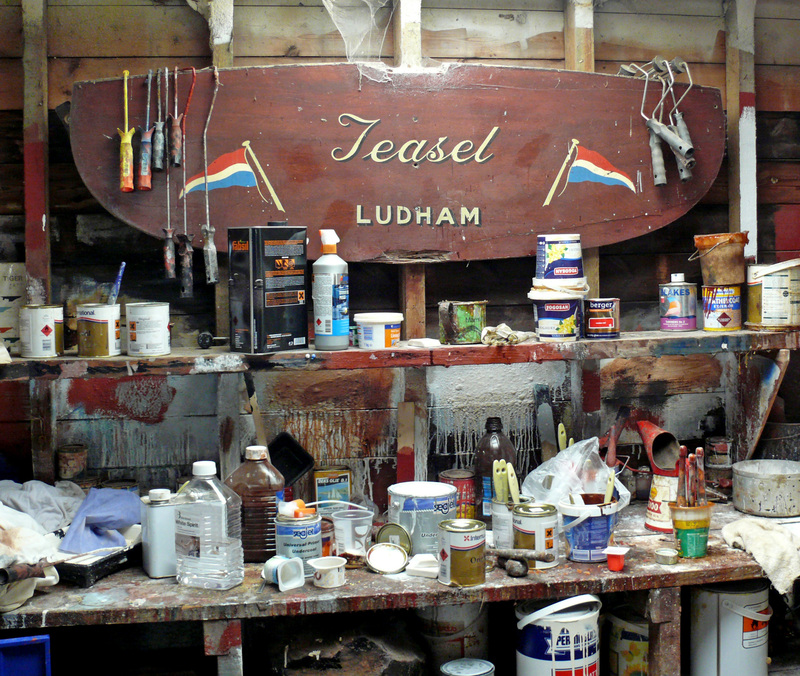 The publishers are currently searching their archives for the original shot, which I remember setting up at Gay Staithe. Sadly this abridged version of the books lacks Ransome’s own illustrations. What would you like to see inside the packaging? Would you like an illustrated book talking about how the series was made? I suggested they edit the episodes together into two films. I understand some parents like being able to show each 28 minute episode at a time. We loved the opening titles graphic and music at the time but they seem rather dated now. DVDs now offer Extras, of course. We could put together a slide-show using my behind the scenes photos voiced with a commentary explaining how the serial was made. Would this spoil the magic? I’d love to go searching for the locations we used. I wonder if Countryfile would be interested in this? Do add any other ideas or requests to the Comments below. We chose the pug as a puppy so he really was called William. He was quite young and playful when the series was made. Sadly Revelation Films only own the UK rights but I’ve noticed you can buy it on Amazon.com . There are other outlets but you want to be able to guarantee the quality. I loved seeing Roger’s photographs of the Fairway yachts in full sail. Perhaps one of Lullaby should be on the new cover of the DVD. Everyone on the unit – certainly all the children in the cast, adored Susannah Buxton. She was only about thirty-three and had not been a costume designer long. A tall red-head, she admitted to often struggling to her feet on set when the Lighting-Camera man called for a certain light. I’ve just read a review on Amazon.co.uk about ‘Coot Club’, which said, ‘Wonderful attention to period detail. Even the film’s colours are right for the period.’ They certainly were. Susannah managed to source a huge number of original hand-knitted garments. While she was dressing the children, deciding what they should wear at the beginning of a new day in the story, Susannah explained that she was keen that they didn’t look too chocolate-boxy. The girls playing Dorothea and the Farland twins were all so pretty it would have been easy to go over the top. She carefully combined elements of school uniform with 1930’s clothes that children would have worn in their summer holidays. I can’t remember any member of the cast being uncomfortable – either two cold or two hot, even though we spent three months filming on the Norfolk Broads. ‘How did you become a designer?’ I asked her. She explained that she loved clothes and it was what she always wanted to do. She’d been working freelance as an assistant in Bristol, thinking she wouldn’t get to design on a television production for years, when the phone rang. ‘I was asked if I could take on the role of costume designer, so I took a deep breath and said, “Yes.”‘ Here I have to explain that many members of the crew had come up from BBC Bristol, which then had a regional crews available to work on period dramas. Our Producer was very pleased about this. He used a crew from BBC Bristol again when we made ‘My Family and Other Animals’ on Corfu a few years later. Susannah had a wonderful assistant called Helena and at least three dressers, including Paul Higton and Lesley Bowling, who were not only meticulous but great fun. Lesley Bowling on location in 1983. The hand belongs to Paul Higton. The size of the costume department reflected the difference between the 1974 feature film of ‘Swallows and Amazons’, which was shot in the Lake District with a small cast and very few crowd scenes – when the one Wardrobe Master was helped only by my mother – and our BBC TV adaptations of Arthur Ransome’s books set in Norfolk. ‘Coot Club’ and ‘The Big Six’ had much bigger casts, with many more roles for adults and supporting artistes. 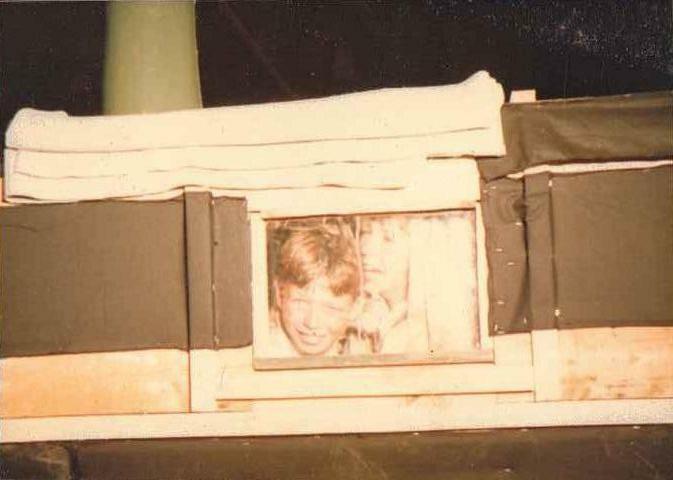 I was looking after the eight children in the lead parts and another six or seven boys in supporting roles, not to mention children who appeared as extras in the village scenes. It was Paul and Lesley’s humour that oiled the wheels that kept us running smoothly. ‘The Big Six’ had to be taken through costume and make-up almost every day for three months and these were costumes that had to stay clean all day. The children were obliged to wear life-jackets when they were near water, right up until the time when the director went for a take. Obviously, these had to go straight back on after each camera set-up. I can still see Paul Higton with an armful of colourful life-jackets he was handing back to five boys at a time. He went on to become the costume designer on forty-eight episodes of Dangerfield and more than 825 episodes of the TV series Doctors. Jake Coppard receiving a soaking from Paul Higton while Nicholas Walpole and Mark Page escape getting wet. Susannah Buxton went on to have the most dazzling career. I last saw her when she was striding along the South Bank in London one evening. I didn’t know that she had worked on so many movies. These have included, Millions, 2004, directed by Danny Boyle, ‘As you like it’, directed by Kenneth Branagh and ‘Death defying Acts’, which starred Catherine Zeta-Jones. She won a BAFTA award for ‘Mr Wroe’s Virgins’, directed by Danny Boyle, an RTS award for ‘Shooting the Past’, which was directed by Stephen Poliakoff, and a number of awards for ‘Downton Abbey’, including an Emmy for Outstanding Costume Design. I’m not sure she imagined all this would be in store for her when she was busy loading costumes into a boat on Horning Staithe back in 1983. Julian Fellowes’ finest moment as an actor was playing Jerry, one of the hated Hullabaloos, in the BBC adaptation of Arthur Ransome’s book Coot Club, or that is how I’d cast my vote. He stood on the bows of the Margoletta, as she motored at speed towards the camera, relishing every moment as the leader of the callous and nouveau-riche baddies of the Norfolk Broads. He did so, wearing the most revolting mustache. Julian was flanked on one side by the incredibly tall glamorous actors, John Harding and Sarah Crowden, and on the other by David Timson and Angela Curran who, it has to be said, are both on the short side. Descending into the cabin of the Margoletta, and seeing them altogether in their fabulous 1930’s boating costumes was breathtaking and comic all at once. On the first day they were called, the Hullabaloos were all made-up and ready for a scene that we never had time to shoot. Andrew Morgan walked along the river bank at the end of the day, in his sweatshirt and jeans, to join us in the Margoletta, apologising deeply for putting them out. But nobody minded. We’d spent a lovely afternoon, moored in the reeds near Horsey Mere, just getting to know one another. David Dimbleby had come up to see how his son Henry was doing and everyone was full of chatter. Julian Fellowes’ time spent bobbing about on the Norfolk Broads was pivotal, because, as I understand it, the working relationship forged with our director Andrew Morgan led to great things. In 1987 Andrew cast Julian as Brother Hugo in his Si-Fi adventure series Knights of God . John Woodvine and Patrick Troughton, who were with us on the Broads appearing in Swallows and Amazons Forever!, also had leading parts in this, but it was Julian who started to write. In about 1990 Andrew and Julian began to work together as director and writer on a number of costume dramas for the BBC. Little Sir Nicholas was followed by an adaptation of Frances Hodgson Burnett’s novel Little Lord Fauntleroy in 1994/5. We had lunch with them when they were filming at Eastnor Castle in Herefordshire. I was mildly surprised to find a writer on location but it was clear Julian was adding more to the story than just typed pages of the script. When he held up an antique powder- compact and started telling Andrew about the cultural history of women applying make-up in public, I realised there was obviously a creative partnership in operation. They also collaborated on a similar BBC book adaptation, producing a six-part drama serial of Mark Twain’s book, The Prince and the Pauper, which was broadcast in 1996. For this, Andrew and Julian were nominated for a BAFTA Children’s Award. The success of these period dramas established Julian as a producer and screen writer. His next hit was the movie Gosford Park, 2001 for which he was rightly awarded an Oscar. Since then the screenplays have tumbled out: Vanity Fair, Piccadilly Jim, Separate Lies, The Young Victoria, From Time to Time, Romeo and Juliet, Crocked House and Titanic for television. Did it really all start on the Margoletta, up near Horsey Mere? I have just learnt that Sarah Crowden appeared in Downton Abbey as Lady Manville in 2012. Isn’t it wonderful how things come round? If you go to see the film, Quartet, you’ll see quite a bit of Sarah sitting at various pianos. As the credits role they show pictures of the musicians in their heyday. A beautiful black and white photograph of Sarah comes up with the caption ‘Swallows and Amazons Forever!’.